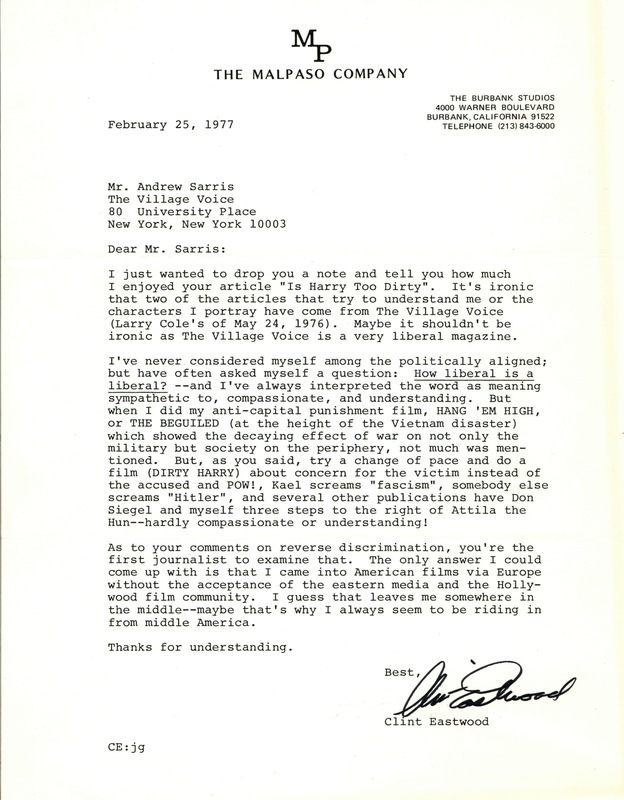 As an intern at RBML this past summer, I had the pleasure of processing the papers of prominent film critic and Columbia professor, the late Andrew Sarris (1928-2012). The papers reveal a rare glimpse into Sarris’s life and work, and document major trends in theory and criticism during a period in which film gained exceptional traction as a true artistic medium. These developments are especially apparent in Sarris’s correspondence, which include letters between other critics, scholars, fans, and a considerable handful of notable actors, actresses, and directors. Among the most fascinating pieces I found in processing this collection is a 1977 letter written by Clint Eastwood. Printed on the letterhead of Eastwood’s own production company, The Malpaso Company, the actor-director-producer thanked Sarris for his article, “Is Harry Too Dirty?” Appearing January 24, 1977 in the Village Voice, the reputably liberal Sarris revisited the 1971 film and employs a decidedly less scathing tone in comparison with his contemporaries. Departing from the diatribes of adversary Pauline Kael, who admonished the film as a fascist attack on liberal values, Sarris understood Eastwood’s character to be more complex and symbolic. Although Sarris was not necessarily an admirer of the film, Eastwood thanks him nonetheless for “understanding” him from a liberal perspective. Perhaps Eastwood’s political leanings were less conspicuous in 1977, because as he claims in this letter he does not consider himself to be “politically aligned”. It is clear today, however, that this is a friendly discourse between two filmic figures on seemingly opposite ends of the political spectrum. This entry was posted in Performing Arts Collections and tagged Film on September 13, 2012 by cl880.